With ancient Roman archaeology and spectacular seaside scenery, UNESCO–listed Pompeii and coastal Positano rank among southern Italy’s must-see destinations. During this adventurous tour, reach both sites of interest in one day in comfort by air-conditioned minivan—with pickup and drop-off at your Rome hotel included. 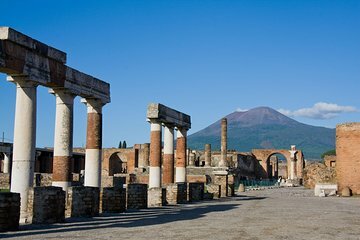 Upgrade to explore Pompeii with a private guide, and stroll along the cobbled streets of pretty Positano at your leisure.